We had fun with Ultraviolet in 2018, but this year we’re ready to move on from the mysteries of the cosmos and dive deep into the ocean. Pantone, the self-proclaimed global authority on color, has declared “Living Coral” the color of the year for 2019. 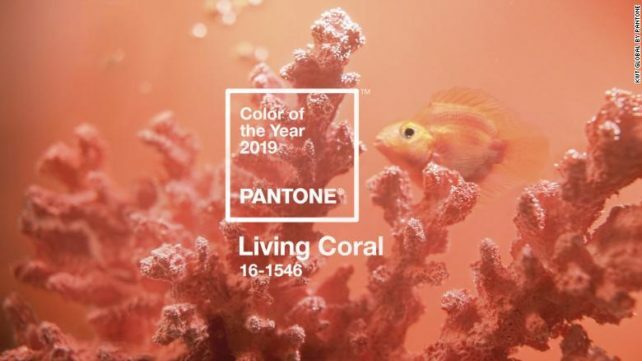 “Just as coral reefs are a source of sustenance and shelter to sea life, vibrant yet mellow, Pantone 16-1546, Living Coral embraces us with warmth and nourishment to provide comfort and buoyancy in our continually shifting environment,” Pantone announced Wednesday. New Jersey-based Pantone picks a new color each year based on socioeconomic conditions, fashion trends, new technologies, as well as new trends in the realms of lifestyle, art, music, travel, and of course, social media. “Color is an equalizing lens through which we experience our natural and digital realities, and this is particularly true for Living Coral,” Leatrice Eiseman, Executive Director of the Pantone Color Institute, said in a statement. “With consumers craving human interaction and social connection, the humanizing and heartening qualities displayed by the convivial Pantone Living Coral hit a responsive chord. “According to Pantone, the engaging nature of living coral “welcomes” and “encourages” lighthearted activities, and its authenticity enables connection and intimacy. “In its glorious, yet unfortunately more elusive, display beneath the sea, this vivifying and effervescent color mesmerizes the eye and mind,” Pantone said in the news release. “Lying at the center of our naturally vivid and chromatic ecosystem, Pantone Living Coral is evocative of how coral reefs provide shelter to a diverse kaleidoscope of color.” Pantone also looked to nature for its color of the year in 2017, when it chose the shade Greenery.